Chicago’s longest serving alderman has been re-elected to an unprecedented 13th term despite a highly publicized federal charge of attempted extortion. Ald. Ed Burke may have missed a runoff election by just a few percentage points – the alderman had 54 percent of the vote as of 10 p.m. on election night with 93 percent of votes counted. Burke faced two challengers in the predominantly Hispanic Southwest Side ward: 28-year-old civil engineer Tanya Patiño, who trailed Burke with 29 percent of the vote; and attorney Jaime Guzman, who received 16.5 percent of the vote as of about 10:30 p.m. Throughout the night, Burke’s campaign remained mum on the alderman’s whereabouts. Burke briefly spoke to reporters outside while leaving his ward office with about 75 percent of votes counted. “With what I’m hearing about my colleagues around the city in so many upset races, it does make me feel even better,” Burke said, referring to unseated aldermanic incumbents such as 1st Ward Ald. “Proco” Joe Moreno. Burke pushed back on claims he was behind a recent mailer sent out in his ward which read, “This is what change looks like” above a photo of Patino and a Hispanic group of supporters that includes U.S. Rep. Jesus “Chuy” Garcia. Video: A live shot from Ald. Ed Burke’s office just before 8 p.m. Tuesday. Burke’s win is another turn in a dramatic few months for the alderman. In late November, federal agents raided his ward and City Hall offices, returning in December to his City Hall office. Five weeks later, he was charged with attempted extortion and, the following day, resigned as the chair of City Council’s powerful Finance Committee. And earlier this month, Garcia accused Burke of electioneering after releasing a video to Chicago Tonight showing 75-year-old Burke passing out tote bags while arguing with a poll worker. 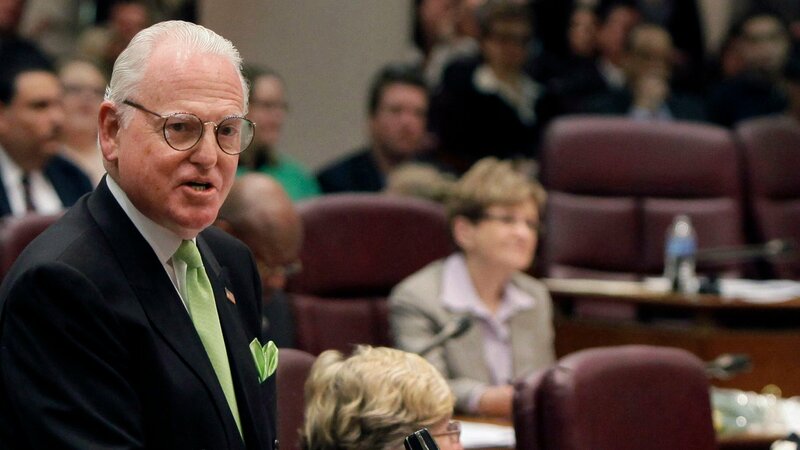 Federal authorities are now building a case against Burke for allegedly using his position as alderman to steer business towards his personal law firm, which handles tax appeals. Challengers Guzman and Patiño faced an uphill financial battle in competing with the millions of on-hand campaign cash and investments Burke controls. As of the last quarterly candidate report filed Dec. 31, Burke has access to more than $4.5 million in combined cash on-hand via three political committees: Friends of Edward M. Burke, Burnham Committee and 14th Ward Regular Democratic Organization. In their Dec. 31 filings, Patiño’s political committee reported slightly more than $128,000 cash on-hand while Guzman’s committee reported less than $15,000 in its on-hand campaign cash coffers. Burke’s aldermanic run is shadowed by the defeat of his brother state Rep. Dan Burke by a political newcomer with ties to Patiño. In last year’s March primary, high school counselor Aaron Ortiz, Patiño’s boyfriend, unseated state Rep. Burke, ending his 28-year run in the Illinois House. Patiño worked on Ortiz’s successful campaign for Illinois’ 1st District, which was also endorsed by Garcia. Burke’s recent legal troubles have pushed the issue of City Hall ethics to the forefront of Tuesday’s municipal elections, with several candidates calling for a ban on outside employment for aldermen among several reforms. The predominantly Hispanic 14th Ward includes the Southwest Side neighborhoods of Archer Heights, Gage Park and West Elsdon.